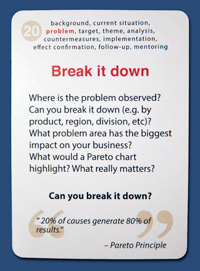 This is one of the best Lean learning tools I’ve seen in recent years. 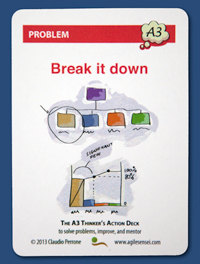 The A3 Thinker Action Deck contains a set of 71 brainstorming cards to help you systematically frame, analyze and eradicate your most critical problems in your workplace and personal life. The deck contains hundreds of questions to help you develop a deep, fact-based, and shared understanding of the true nature of a problem, its causes, and how to address them. The A3 Thinker’s Action Deck is used by hundreds of companies worldwide, including Toyota, Spotify, Honeywell, Carl Zeiss Microscopes, Nissan North America, McKinsey, Skype, BearingPoint, J.P. Morgan, and many others. Clearly, this Action Deck is not something you’d leave collecting dust in a bookshelf after you’ve glanced at it a couple of times. It is a practical and versatile tool, designed to work with you side-by-side and help you achieve tangible results when and where you need them most. It fits easily in your pocket and it is crafted with smooth-finish casino-quality card stock for maximum portability and durability. The front of each card features a set of thought-provoking questions which will help you frame problems with improved clarity, accuracy, precision, relevance, depth, breadth, logic, and significance. The opposite side presents an original cartoon to further illustrate each concept vividly. Cards are organized into 10 sections that will guide you through a time-tested problem-solving and improvement sequence: Background, Current Situation, Problem, Target, Theme, Analysis, Countermeasures, Implementation, Effect Confirmation, and Follow-Up. An additional Mentoring section will help you throughout the sequence to review and challenge what you know so far, probe other people’s thinking and engage teams and co-workers in powerful conversations. 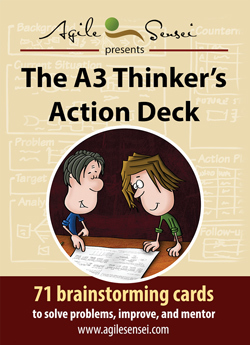 As many early adopters already reported, the A3 Thinker Action Deck will likely more than pay for itself at the first improvement you make. It is based on the author’s years of hard-won experience in applying and deploying the A3 Thinking management approach originated in Toyota and adopted by Lean organizations worldwide. The approach directs people’s behavior towards gaining and sharing insights, capturing the story of a problem, gain wider consensus, expand their circle of influence, raise visibility within their organizations, setting baselines for continuous improvement, and more. change the world! One problem at a time.